ITC caught without conditional use permit! Within the past few months, several landowners in Faribault County have expressed their concern and dread over ITC Midwest’s upcoming installation of a large electric transmission line spanning 73 miles of southern Minnesota’s prime farmland. Some residents have been able to rest easy knowing that construction will not begin until 2016; however, ITC Midwest has already begun their move into Faribault County. During last Tuesday’s Faribault County Board of Commissioners meeting, Michele Stindtman, the Faribault County Planning and Zoning program administrator, addressed her discovery of an unauthorized staging ground outside of the city of Wells. ITC Midwest, the company behind the construction of a new high-voltage electric transmission line in southern Minnesota, has set up a staging ground on a piece of property annexed by the city of Wells. According to mn.gov, staging areas are required in 25 mile increments along the route to serve as a delivery and storage ground for construction equipment. Because the property is outside of city limits, the area still requires a conditional use permit (CUP) as issued by Faribault County Planning and Zoning. The piece of land being used by ITC is zoned A2, or a general agriculture site. The property includes three waste water ponds, a number of quonset huts, a rifle range and the ITC staging ground. Stindtman spoke to Wells city administrator Robin Leslie about the unauthorized site and Stindtman suggested acquiring a conditional use permit that umbrellas the three areas the ITC staging ground, the waste ponds and the rifle range. As of last Tuesday, Stindtman had not heard from Leslie. 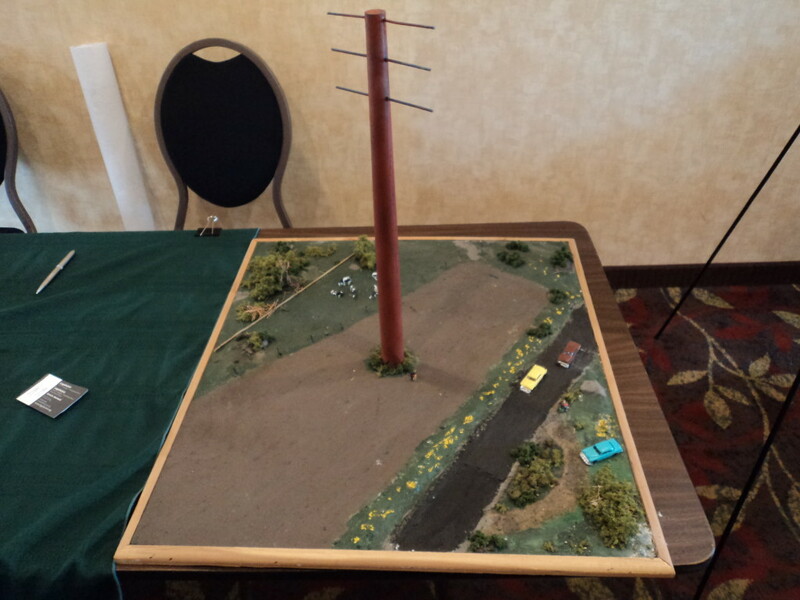 Within the past few months, several landowners in Faribault County have expressed their concern and dread over ITC?Midwest’s upcoming installation of a large electric transmission line spanning 73 miles of southern Minnesota’s prime farmland. Some residents have been able to rest easy knowing that construction will not begin until 2016; however, ITC?Midwest has already begun their move into Faribault County. However, the staging area in question is not actually on the route; therefore, ITC needed to obtain rights to use the land from the affected landowners. “They would have asked the city for permission because it’s city property,” said Commissioner Bill Groskreutz addressing an inquiry as to who gave ITC permission to use the grounds. Because the property is outside of city limits, the area still requires a conditional use permit (CUP) as issued by Faribault County Planning and Zoning. The piece of land being used by ITC is zoned A2, or a general agriculture site. The property includes three waste water ponds, a number of quonset huts, a rifle range and the ITC staging ground. Today, the Minnesota Public Utilities Commission approved the Certificate of Need and the Route Permit for the ITC Midwest transmission project. The good news is that the route was modified and isn’t going to run right through the city of Sherburn, but the Commission did not direct ITC to remove the transmission lines from Fox Lake and Lake Charlotte and double circuit that line with the ITC project. Commissioner Boyd, acting as Chair in the absence of Chair Heydinger, did acknowledge the importance of addressing the macro picture of cost apportionment of this group of projects to Minnesota, that we have this specific project to address, but we do have to deal with this larger cost issue, but in a different venue. That validation helps, but when are we going to deal with it and how? The FERC docket has long since passed, what position did Commission take during that MVP tariff and cost apportionment review? It’s a bit late, because they’ve decided and now Minnesota has to live with it… or do we? What options are there? Oh well, they didn’t touch it. Commissioner Boyd was gracious about not recusing, went over his involvement with UMTDI over the years, and noted that raising this was legitimate, I think he said “the right thing” or some such. But he didn’t recuse. I’d also asked Commissioner Lange to recuse herself, due to her long time employment with Izaak Walton League, intervenors in SUPPORT of this project, and all their transmission promotion and advocacy agreements and funding. She said that she’d discussed it with PUC counsel during the break and they decided that her involvement with the Waltons did not rise to the level requiring recusal. At least she talked about it, but given her position, and that of Bill Grant, her former boss at the Waltons who is now the Commerce Deputy Commissioner in charge of Energy, that’s pretty much cornering the market, and an issue that the Commission should tackle directly. Oh well… waiting for the written order to come out, and it will probably be soon because there wasn’t much at issue. And I should mention that Jeff Small, attorney for MISO, was not at all happy with my statements about the hearing and my characterization of MISO witness Chaterjee’s testimony, saying I’d misrepresented it. To the extent that I said that I’d been able to ask “only 3 questions,” he’s technically right in that I was allowed to ask questions in three AREAS, and to which he objected to at the time, and I was able to ask a grand total of 8 questions, one of which was in response to a request for clarification by the witness, so really SEVEN questions. The issue is unreasonable limitation of questioning, and the importance of the testimony elicited, limited as it was. Small, however, believes I misrepresented Chatterjee’s testimony before the Commission, and the number of questions. In my statements to the Commission, I asked them to refer to the transcript for the specifics, knowing that it was a representation and not a direct quote. I’d copied the transcript at the library, cited it in our brief, and here is the ENTIRE session of question and answer, all 7 or 8 questions, depending on how you count, and Chatterjee’s response. This was one of the most dreadful dockets I’ve participated in, between the limitations as a “limited’ Intervenor, the “Clean Energy Intervenors” advocacy for the project, and this was it for cross-examination — an Evidentiary Hearing short circuited and essentially tried on the pleadings, despite a last second change in position of Commerce-DER. 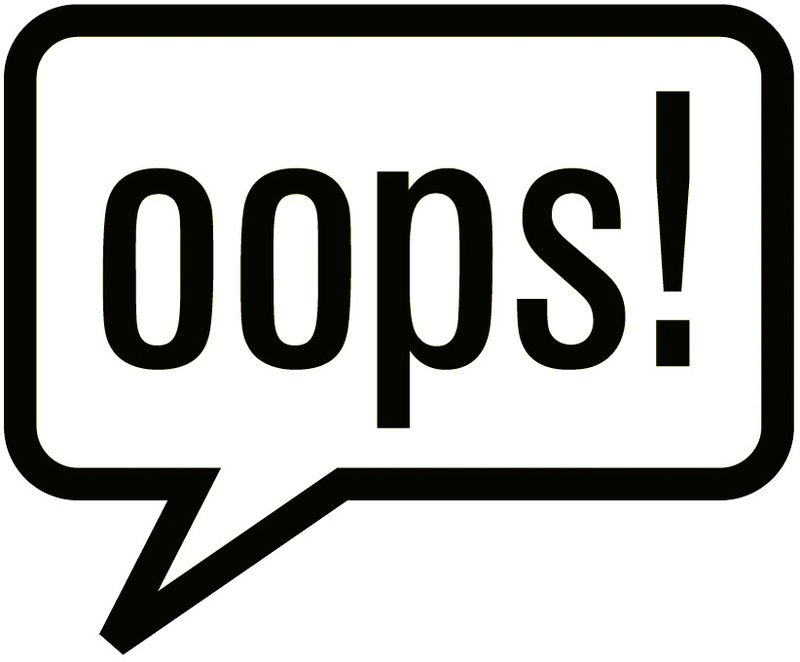 Check the transcript for questions to Dr. Rakow regarding is last minute change of position. The public interest was pushed out of the mix, oh-so-relevant questions were not asked, and important issues were not reviewed. Where the ALJ does a verbatim cut & paste of the Applicant’s proposed Findings of Fact, that is NOT thoughtful consideration, no way, no how. 12 JUDGE LAFAVE: Ms. Overland. 13 MS. OVERLAND: Thank you. 16 Q Good afternoon, Mr. Chatterjee. 24 cross-examination would deal with. 4 them, if you would like? 9 was have any of the MVP projects been disapproved. 12 transfer, why, and how much. 13 Those were the three that I laid out. 14 JUDGE LAFAVE: Please proceed. 15 MS. OVERLAND: Thank you. 25 that the SPS is protecting against. 1 Q Thank you. That’s what I needed to know there. 3 projects have been disapproved. 5 been approved at this point? 8 in Illinois, ATXI project, did receive approval. 12 MVPs at this point that have received approval. 18 A Yes, I am. 21 such a thing as an MVP project? 23 project at the time that it received approval. 4 from Appendix B to Appendix A. 6 have MVP status; is that correct? 19 A In what context? 20 Q In the context of MVP 3. 4 or 6,000? Where do you stop? 14 range of 200 to 300 megawatts. 2 planning reserve margin requirement. 6 but wind has a very small capacity credit value. 8 that is an important context. 20 it’s impractical to do that. 24 consequence of generation prices and load prices. 25 And that is the PROMOD study in the MVP analysis. 12 negative impact on the most efficient set of units. 15 see a savings in your adjustment production cost. 18 Thank you. That’s all I have. 20 JUDGE LAFAVE: Thank you very much. 24 JUDGE LAFAVE: Ms. Currie? 25 MS. CURRIE: No questions. 1 JUDGE LAFAVE: Mr. Small? 3 a couple of questions for Mr. Chatterjee. 9 development; is that correct? 10 A That is correct. 12 Illinois Rivers Project. Do you remember that? 13 A Yes, I do. 14 Q And is the Illinois Rivers Project a single MVP? 23 A It can be. 1 Rivers Project; is that correct? 2 A That is correct. 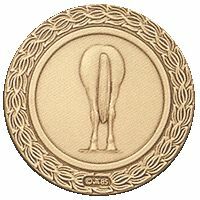 3 MR. SMALL: Thank you, Your Honor. 4 JUDGE LAFAVE: Thank you. 6 MS. JENSEN: Nothing, Your Honor. 7 JUDGE LAFAVE: Ms. Agrimonti? 8 MS. AGRIMONTI: Nothing, Your Honor. 13 MS. OVERLAND: Nothing, thank you. 14 JUDGE LAFAVE: Thank you very much. 16 JUDGE LAFAVE: Thank you, Ms. Overland. Motions for Reconsideration are due 20 days after the Commission’s written Order is filed. October 23, 2014 @ 9:30 a.m.
Thursday, the ITC Midwest, LLC application for its MN/IA Transmission Project is before the Public Utilities Commission. Minn. Stat. Ch. 322B does not equal Minn. Stat. 301B.01 (or Ch. 301B). Will the Public Utilities Commission care? We shall see. 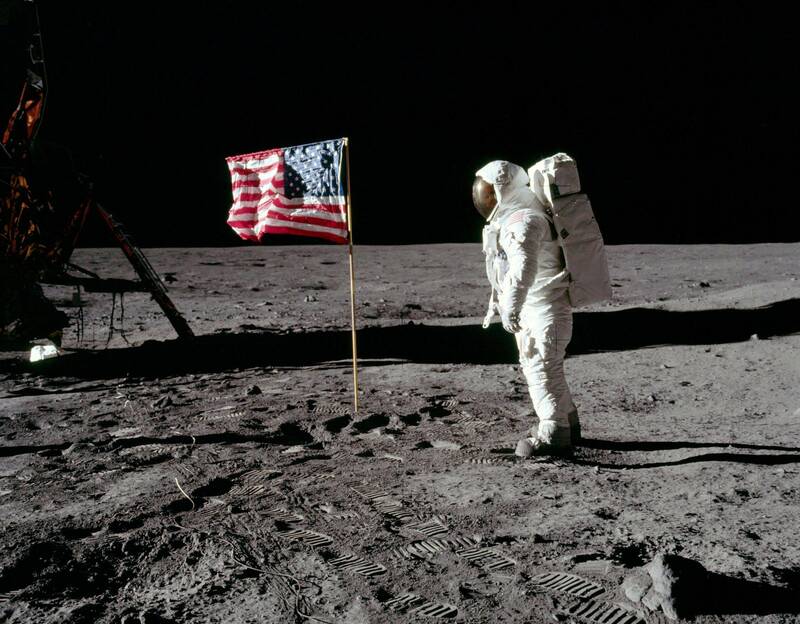 One small step… and a giant leap! A tCapX 2020 related ransmission easement settled, and at more than twice the original offer. Yeah, we can live with that. The troubling thing is that the appraisal didn’t really make sense, and they way they came to the appraisal amount didn’t add up. But despite that, the bottom line was good, so we’re not going to quibble. Onward, heading up north for transmission hearings for the Not-so-Great Northern Transmission Line. Stop everything — FREEZE — mark your calendar for October 23 at the PUC! 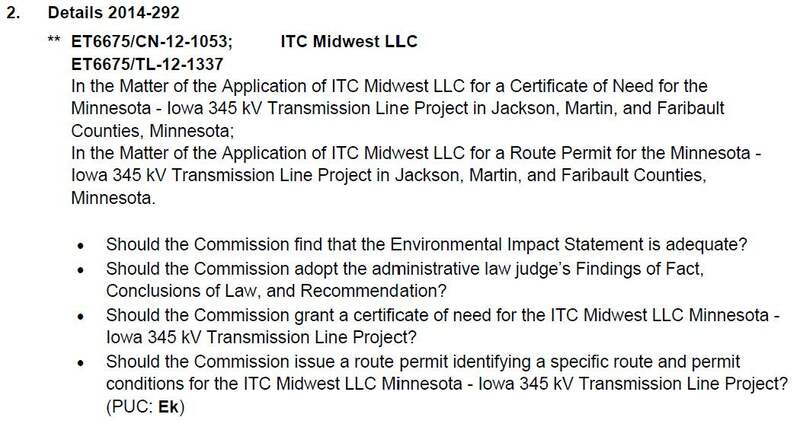 The ITC Midwest MN/IA 345 kV Transmission Project Certificate of Need (12-1053) and the Routing Permit(12-1337) will come before the Minnesota Public Utilities Commission on October 23, 2014. Thursday, October 23, 2014 @ 9:30 a.m.
It’s #2 on the agenda, so it will begin at a little after 9:30, but get there by 9:30 because these things sometimes go FAST! In the No-CapX-2020-Exceptions-to-ALJ-Recommendation, I’d requested Oral Argument for the parties. Will there be a public comment option? If you’re interested in making your comment directly to the Commission at that meeting, email burl.haar@state.mn.us and scott.ek@state.mn.us and request time for public comment. They don’t always allow public comment, so it would be best to ask for it ASAP. Some time before October 23, staff will post their “staff briefing papers,” one for the Certificate of Need, and one for the Route Permit, and also DoC-EERA (the routing side of Commerce) will have their recommendations too focused on the route. I’ll send them around before the meeting, but do keep an eye on the dockets over the next week! The Briefing Papers will give you an idea where staff is on this, if they have a recommendation. Well this is getting interesting. Mayo Clinic has weighed in, opposing the Badger Coulee transmission project because it wants to build more revenue generating options in Onalaska! Cheaper power, they claim… how many rate increases, how often, for Minnesota and Wisconsin ratepayers? Mayo — if you’d just direct your resources to challenging need for this project, it’s vulnerable, and you could make a difference! Put your money where your clinics are and just say no! 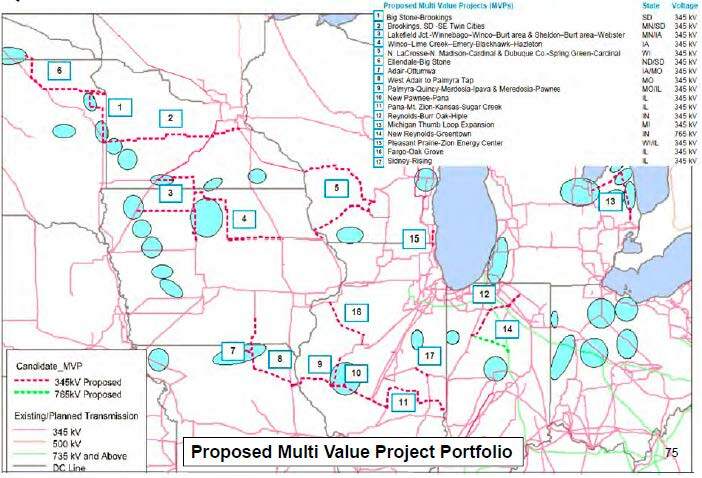 LA CROSSE, Wis. — Mayo Clinic Health System-Franciscan Healthcare objects to one of the routes for the Badger-Coulee power transmission line because it could stymie development on its new 187-acre property in Onalaska or its 8-year-old clinic a few miles away. Although the La Crosse-based system has not determined its plans for the parcel it bought in February, chief administrative officer Joe Kruse said Monday that he and CEO Tim Johnson have filed an objection with the Wisconsin Public Service Commission to the southern route of two proposed pathways. They sent the letter last week as part of the public comment period on the proposed routes. Friday was the deadline to be included in the project’s environmental impact statement. “We are planning to use the property for future health-care services,” Kruse said in an interview. 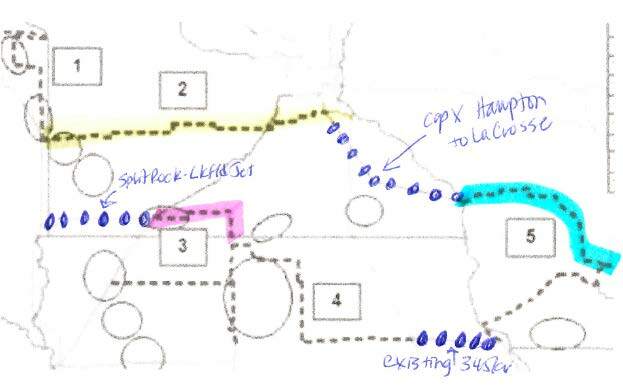 The southern route proposal runs from Briggs Road south along Hwy. 53 into the city of Onalaska, east along I-90 to west of Sparta, veering south to Cashton and east to I-90/94 into Dane County. 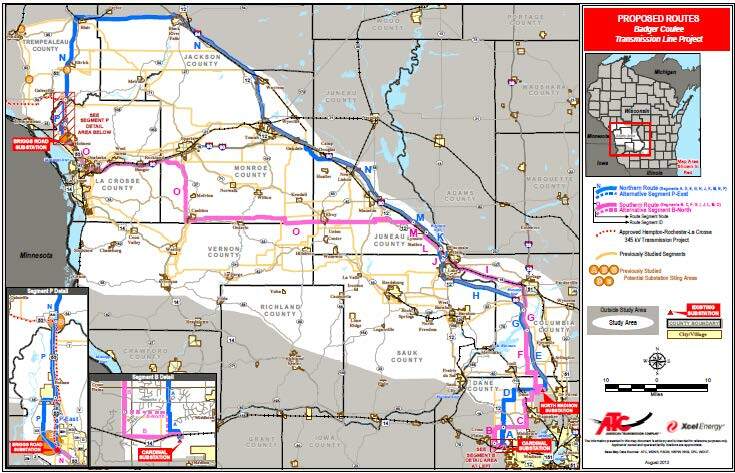 The northern route would run from the Briggs substation north to Ettrick and Blair, east to Black River Falls and along I-90/94 to Dane County. The Mayo-Franciscan letter expressed concern that the southern route would make the south end of the property at 1240 Sand Lake Road, across from Menards, unusable for patient traffic. “We’re also concerned about a possible helicopter flight path — not that we’re planning that, but we don’t want to preclude it,” Kruse said in the interview. Turning east along I-90 brings Mayo-Franciscan’s 100,000-square-foot, 8-year-old clinic at 191 Theater Road into play, the letter to the PSC says. The clinic has 150,000 patient visits per year. Mayo-Franciscan is not alone in its objections. About 100 units of government, including La Crosse County and the city of Onalaska, as well as hundreds of residents, have filed objections to the Badger-Coulee project. More than 1,600 Onalaska residents have sent dissenting letters, said Brea Grace, the city’s land use and development director, adding that city officials also will be able to speak at public hearings. Concerns about health issues blamed on power lines, aesthetics and land values are among the objections, Grace said in an interview. The southern route would pass within 300 feet of 160 residential properties and 72 businesses, she said. It would be within 500 feet of five day-care facilities. The proposal’s draft statement acknowledges potential land-value reductions up to 14 percent, with an average of 4 percent to 10 percent in the Midwest, Grace said. PSC officials said they have not tallied the total number of communications they had received about the routes by the deadline. Wisconsin ratepayers would support the cost for the line, estimated at $540 million to $580 million. ATC and Xcel say the line would improve system reliability, deliver cheaper power for Wisconsin consumers and provide a pipeline for wind energy from Minnesota and Iowa to population centers to the east. The three-member PSC will determine whether the project is necessary and serves the public interest. The commission can approve, deny or modify the proposal and will select the route if the project is approved. Public hearings are expected in December, with a final decision possible in May. The state’s departments of Natural Resources, Transportation and Agriculture, Trade and Consumer Protection also have roles in reviewing the application. CapX 2020 construction is marching on. The other day I went down to Rochester and saw the structures coming out of the “North Rochester” substation heading east. Here’s the CapX 2020 page on youtube!